The beauty of spring in a tasty pasta dish. Asparagus lovers are in heaven: Asparagus season, which lasts for a brief two months, is in full swing in May. Asparagus originated in eastern Mediterranean region, but today is grown worldwide: Italy, the U.S., South America and Africa all grow their share. There are three types of asparagus—green, purple and white. Green, the most common, has a green stalk and a purple tip. White asparagus, popular in Germany, was first created in Argenteuil, France as a delicacy: It is green asparagus grown in the dark but with exposure to ultraviolet light (alternately, earth is piled on top of the stalks so that they grow “underground”), and in our opinion has more of a visual interest than flavor. Purple, or violet, asparagus has higher sugar and low fiber levels. It was originally developed in Tuscany and sold as Violetto d’Albenga, after the valley where it was grown. While white and purple asparagus are modern creations, green asparagus has been enjoyed since Greek and Roman times: There is a recipe for it is in oldest surviving book of recipes, De re coquinaria, Book III, written by Marcus Gavius Apicius in the third century A.D. Asparagus is rich in vitamins A and C, folic acid, potassium and the flavonoid rutin, plus fiber; it has no fat or cholesterol and is very low in sodium. It is a delicious diet dish steamed or grilled with a squeeze of fresh lemon or lime (one cup has 27 calories), or sautéed for those with some calories to spare. Asparagus also blends well into other dishes, as we show below. 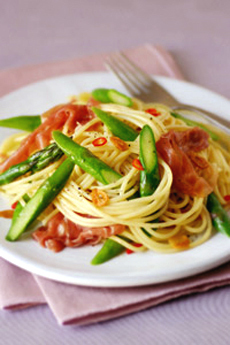 This simple, unsauced dish combines the delectable umami-rich tastes of asparagus and salty Parma ham with the accent of a hot fresh chile. It also can be made with flat fettuccine* or round spaghetti. The recipe serves four. *Fettuccine is the Italian spelling; fettuccini is an Americanization. Peel the asparagus if necessary, then boil gently in a large pot salted water until al dente. Don’t overcook: The asparagus will continue to cook a bit when removed from the water and will be heated further in Step 4, below. Remove and slice diagonally. Boil the pasta in salted water, but remove 2 minutes before the end of the standard cooking time. Place the garlic, chile and olive oil in a frying pan, and heat gently over a low flame until the garlic has browned. Add the ham and the sliced asparagus, and heat gently. Add about 3 tablespoons of the pasta boiling water to the oil in the pan, stir in the cooked pasta and season to taste with salt and pepper. Serve immediately. Adding the pasta boiling water at step 4 provides a mellow saltiness, increasing the flavor and improving the texture of the pasta. It is a good idea to add some cooking liquid to pasta dishes that do not have much sauce: It prevents the dish from being too dry. Recipe and photo courtesy of Umami Information Center, UmamiInfo.com. Other material Lifestyle Direct, Inc. All rights reserved. Images are the copyright of their individual owners.